In July 1622 Captain Wynne reported to George Calvert that "the forge hath been finished this five weeks." It is not surprising that the forge was among the first buildings constructed at Avalon. 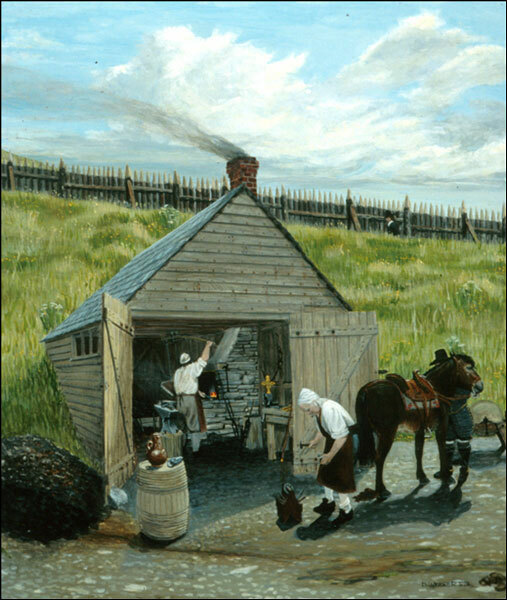 This modern painting by David Webber shows how the forge appeared during the 1620s. The forge was in use from 1622 to mid-century. Reproduced by permission of the Colony of Avalon Foundation, Ferryland, NL. Next to food and shelter, a forge was one of the most important elements in any attempt to plant a permanent settlement in North America. Virtually every tool used for carpentry, masonry, fishing, planting, harvesting and husbandry, as well as most construction hardware, was made and repaired by a blacksmith. So important was the trade that among the 32 settlers who spent the winter at Avalon there were two smiths – Thomas Wilson and John Prater. Prater and Wilson worked in a small shop about 3.4 metres (11 feet) in width and 5.2 metres (17 feet) in length. Probably because of a lack of level land, it was excavated into a steep bank at the southwestern edge of the settlement. Although no trace of the smithy remained visible on the surface of the hillside, the obvious difference between the soft fill overlying the forge and the almost rock-hard subsoil made the definition of the forge room a simple matter. The floor was covered with a thick layer of slag, scale, coal, charcoal, iron scraps and other artifacts. These shears were found during the excavation of the Avalon forge. The smaller arm fitted into a workbench to allow the smith to operate the shears with one hand. 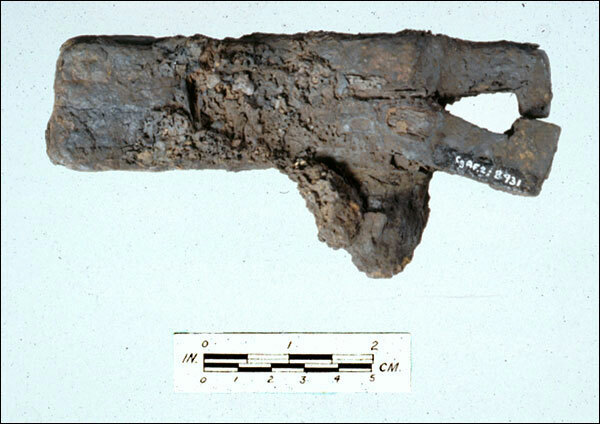 This vise was discovered in the forge during the excavation of the Colony of Avalon. The screw tightened the jaws on small objects being forged, not unlike today's vise-grip pliers. The stone forge, traces of the posts that supported the bellows, the anvil stump and other features could be identified clearly. The layout of the forge is shown on the accompanying illustration. It is remarkably similar to forges still in use, probably a reflection of the fact that it represents the most efficient use of a restricted work space. Tools and artifacts found in and around the forge indicate that the Avalon smiths provided a variety of services. In addition to manufacturing building and marine hardware, they served as gunsmiths, locksmiths and farriers, as well as repairing brass kettles, casting shot and perhaps manufacturing gun flints from flint brought from England as ballast. Forges have traditionally been gathering places where visiting, gossiping and other social activities took place. 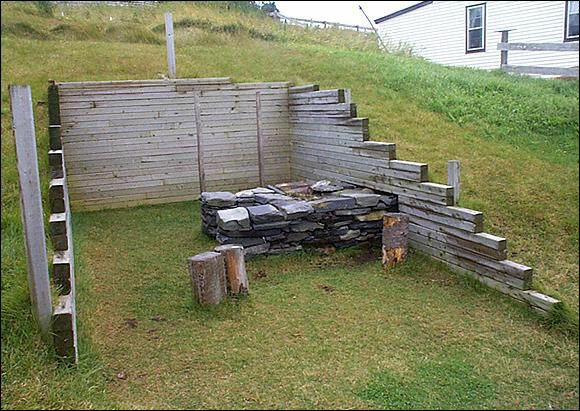 The forge at Ferryland was apparently no exception, for among the work-related objects were large numbers of tobacco pipes, beverage containers and drinking vessels and other artifacts that indicate the recreational activities that took place in the warmth of the smithy.